A UN field office aiming to document human rights abuses in North Korea opened in Jongno in downtown Seoul on Tuesday. The opening follows a North Korea human rights report by a UN Commission of Inquiry in February last year. The center will interview defectors about human rights abuses in the North and set up a database. 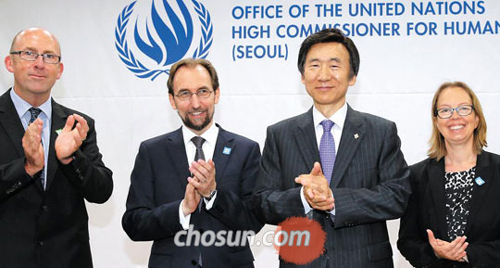 UN High Commissioner for human rights Zeid Ra'ad Al Hussein (second from left) and Foreign Minister Yun Byung-se (third from left) clap at the opening of a UN field office on human rights issues in North Korea, in Jongno, Seoul on Tuesday. UN High Commissioner for Human Rights Zeid Ra'ad Al Hussein, Foreign Minister Yun Byung-se, and Unification Minister Hong Yong-pyo attended the opening. Zeid, a member of the Jordanian royal family and former Jordanian ambassador to the U.S., said the field office will "lay the basis for future accountability." It aims to bring a change to the human rights conditions in the North through cooperation with other UN member states, state agencies, and civil societies. "Less than 50 miles from here lies another world marked by the utmost deprivation," he said. "Millions remain trapped in the grip of a totalitarian system which not only denies their freedom but increasingly their basic survival needs." The National Human Rights Commission of Korea and activists welcomed the office. But some far-left groups held a protest rally, claiming that the field office will "exacerbate tensions on the Korean Peninsula."